Submitted by Alexander Briones on Sep. 14, 2018. To make the most out of your studio monitors, you'll want to pair them up with top quality stands that are designed for studio use. 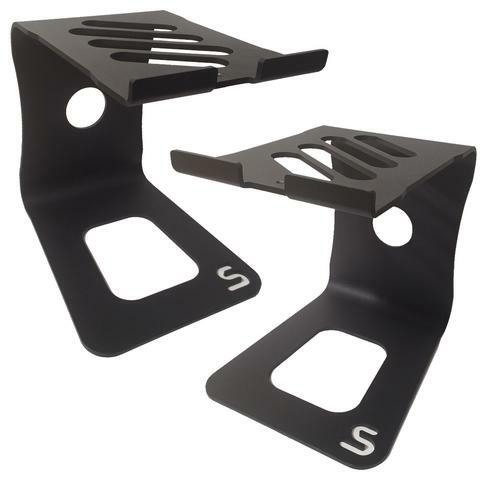 In addition to positioning and securing your speakers, these stands prevent cabinet vibration from transferring to your floor or desk, which results in improved sonic clarity. 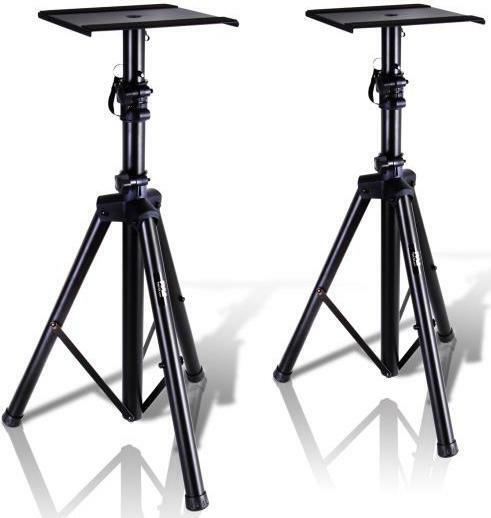 This guide features what the market considers as the best studio monitor stands along with their specifications, divided into two of the most common studio configurations - floor and desktop mounted. The Pyle PSTND32 is a versatile and portable speaker stand that works just as well in the studio and on-stage, thanks to its adjustable height and foldable design. It features rubber grip speaker pads that prevent slippage and distributes the weight of the speaker evenly resulting in stable positioning. This also works together with the rubber cap feet used on the stand's foldable tripod base to reduce unwanted vibrations or resonance. 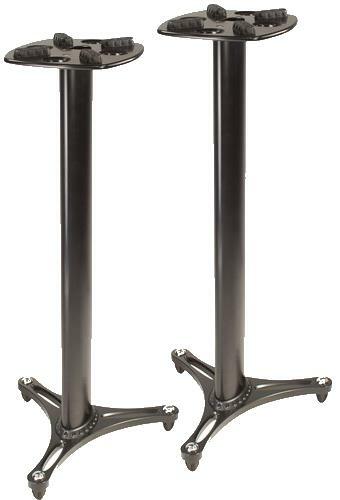 Base Size (L x W): 8.9" x 8.9"
Most users are happy with its overall construction and functionality, describing the PSTND32 as a solid speaker stand. Many also find its portability, adjustable height and built-in rubber mats to be commendable. And since it works just as well as a PA speaker stand, its double purpose adds even more value to its already affordable price tag. There are some reports of missing parts out of the box, but these are more of a shipping issue than an actual product problem. Given that it can carry up to 90 lbs., there are some who wish that the speaker platform was wider to handle bigger speakers. If you're looking for an affordable studio monitor stand that can double as a reliable PA speaker stand, then check out the PSTND32 from Pyle Audio. The Ultimate Support MS-90/36B is especially designed to meet the space and isolation demands of studios. It is crafted from aluminum with three internal channels, two of which are meant for neatly organizing audio and power cables, while the third one is meant to be filled with shot or sand for added stability. This particular model is 36" tall, and comes with four sound-decoupling pads that work with many of the most in demand studio monitors. Top Plate Size (D x W): 10.25" x 12"
Base Size (D x W): 19" x 19"
Market response to the Ultimate Support MS-90/36B is overwhelmingly positive, most of which are from users who are impressed with its overall construction. The convenience of its internal cabling channel is also well appreciated, which many report to greatly reduce cable clutter. Aesthetic quality is also mentioned another of times. 8" studio monitors from Rokit, KRK, Yamaha and many more are reported to be working well with this stand. There are a few who reported minor finish blemishes, while others are looking for extras like adjustable rubber pads for easier leveling of the speaker. Being the top rated studio floor monitor, the Ultimate Support MS-90/36B gets our top recommendation. The Ultimate Support MS-90/45B is similar to the 36B version, with the main difference being its taller profile, which is 45" high. As such, it is also designed for studio use, with emphasis on space saving, decluttering and vibration isolation. It is crafted from the same aluminum material with three hollow channels for running power and audio cables cleanly, and for adding in sand or shot for added weight and stability. 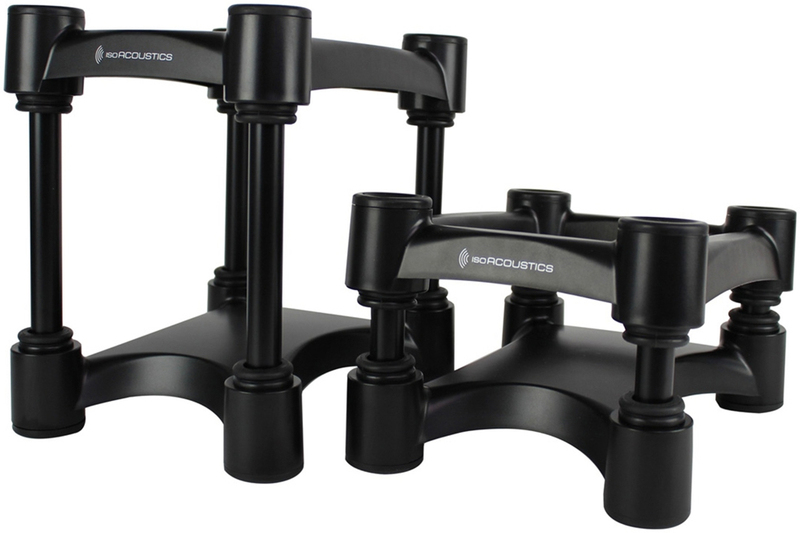 Finally, it comes with four sound-decoupling pads that comfortably sits mosts studio monitors. Esteemed for its rock solid build and excellent vibration, the Ultimate Support MS-90/45B continues to gather rave reviews. Many also appreciate its aesthetic value, especially when considering how it helps declutter their studio space. Various speakers from Focal, JB, Rokit and many more have been reported to sit well on this stand. Not many complaints other than a few who report minor cosmetic flaws. If the 36" version is too low for your studio setup, then definitely consider getting the Ultimate Support MS-90/45B. 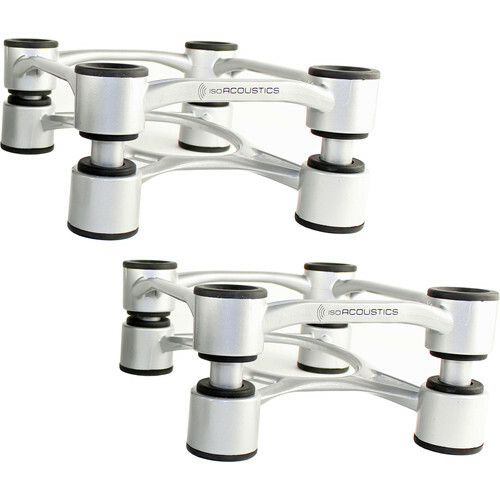 The IsoAcoustics ISO-L8R155 stands are specifically designed for desk mounted studio monitors. It looks simple enough, yet they effectively prevent the transfer of speaker cabinet vibrations to your desk, which prevents unwanted changes to the sound you are listening to. To better accommodate our many different studio setups, the L8R155 also features adjustable height and tilt angle (up to 6.5 degrees up or down) by combining different tubing heights, for convenient positioning. Contact Surface (D x W): 6.1" x 7.5"
Positive reviews continue to pour in for the ISO-L8R155, most of which contain reports of noticeable improvements to sound clarity. To be specific, many users are happy with how it removed the muddiness of the lower frequencies, making for easier monitoring of bass, guitars, keys and vocals. Many also appreciate its simple yet effective height and tilt adjustments. While most are happy with its positive effect on sounds, there are a few who comment that the price should be a tad bit lower. There are also some who encounter leveling issues, since you have to make height and tilt adjustments by swapping parts out. All in all, the extra clarity it provides goes a long way especially for those who work long hours mixing and mastering tracks. We agree with the majority that the IsoAcoustics ISO-L8R155 is well worth the money. With its distinct C-Shape design, the Soundrise Professional desktop speaker stand frees up a bit more space while elevating your monitor speakers and isolating them from your desk. And it looks like these benefits are more than enough for most users to give their honest commendations. At its core is industrial aluminum that's laser cut and bent to form its distinct C-shape profile that can carry many of the most popular studio monitor speakers, including the Yamaha HS5, Rokit 5, M-Audio BX8 and more. Contact Surface (D x W): 8.5" x 6.5"
Simplicity combined with reliability result in a easy to use, set and forget desktop speaker stand. And this peace of mind is what made many users rate this highly. It also gets a lot of commendations for its visual appeal, which many describe as sleek and nice to look at. The pricing seem to be the main point of contention for the few who had qualms about the Soundrise Pro stand, but they are easily outnumbered by the many satisfied users who are more than happy with their purchase. If you're looking for a simple way to raise the position of your monitor speakers, or you're simply looking to make some room on your work desk, then check this out. The IsoAcoustics Aperta 200 is a premium low-profile monitor stand crafted using solid aluminum material which allows it to handle large speakers that weigh up to 75 lbs. More importantly, it does so while keeping vibrations in check with its vibration diffusion capabilities. Finally, built-into this stand is a tilting mechanism with markings for angle adjustments. Base Size (D x W): 7.8" x 10"
Users are impressed with how this simple stand improved their overall listening experience, so much so that even those who were critical at first find themselves more than satisfied. Reports are consistent in saying that it helped reduce low frequency resonance, resulting in a sound that's clearer and easier to listen to. Solid build and ease of use also received a number of commendations. It's premium price tag seem to be the stumbling block for some, but most of those who invested in the Aperta 200 have great things to say about it. If you want no less than the best premium quality desktop monitor stand, then check out the IsoAcoustics Aperta 200. 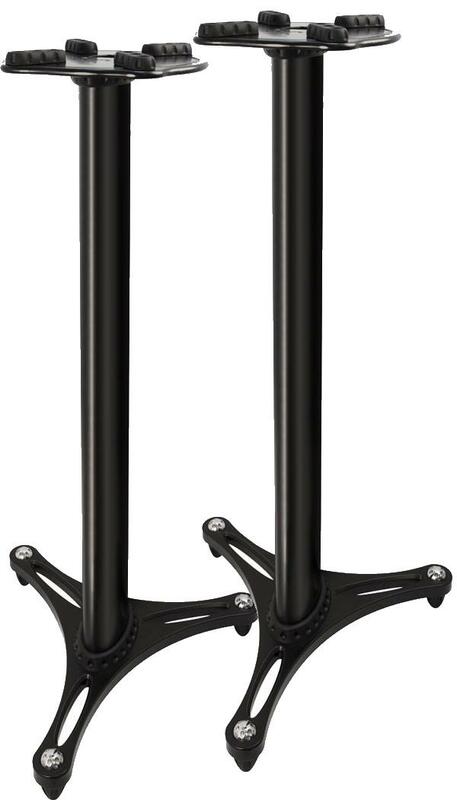 As the name implies, floor stands are meant to be used on the floor, usually in the form of a metal pole that elevates the speakers to a desired height. They are the most common type used on Public Address systems because they can secure and position bigger speakers, but the same principle also applies to studios. Floor stands are ideal because they lift the speakers far from vibrating and reflective materials - like the floor or your desk. But they do usually take a lot of space, and are not ideal for smaller studio monitor speakers (you don't want small speakers too far from the listener). Desktop stands are meant for positioning and isolating smaller monitor speakers on a desk or tabletop. They are usually compact and serve as bottom base for the speakers. As such they don't have the positioning capabilities of a floor mount stand, and are usually limited to smaller speakers. More importantly, they isolate your speaker from your desk, which translates to a clearer sound as attested to by many reviewers. Note that we left out other types of speaker stands, most notably wall mounts, in order to keep this guide focused on the types primarily used in home studios. Isolating or decoupling your speaker prevents unwanted vibration transfer to your desk or floor, resulting in less unwanted noise or frequency issues. This is usually achieved by rubber materials that absorb cabinet vibration, and these are usually placed on the speaker base and on the point where the stand meets the floor or desk. Desktop speakers benefit the most from isolation because they are standing in close proximity to a solid object that reflects audio and transfers vibrations. This is the reason why many desktop stand users report improvements to their sound. The stands featured on this list all have some sort of isolation mechanic built into them, but you can add in some more DIY style if needed. When considering studio speaker stands, you may want to carefully plan how you're going to lay out your cables to match your planned setup. Interestingly, there are some speaker stands that have built-in cable management features. You may also want to extend your budget so you can get back up cables while you're at it. Modern studio speakers generally have wider sweetspots, so getting the speaker in appropriate position is no longer as hard as before. But to make the most of your speakers, you'll want them positioned in the right height and angle that matches your listening position best. This is where height and tilt adjustments come in handy.